From 2012-2013, we worked on a video on careers in diving, where we interviewed 17 different people who have jobs that take them underwater on a regular basis. We also followed each of these people into the field to film them while they were at work. For many people, the lure of working outdoors and not having to report to an office and desk every day is irresistible. For people who love the ocean and being underwater, the opportunity to work in a career where diving is central to their job, makes going to work each day more like an adventure than a chore. Of the 17 different people we interviewed, several were involved with different aspects of underwater law enforcement (FBI diver, sheriff’s diver, game warden), one was a commercial diver, another was a seafood diver, others were involved with photography, scuba instruction, diving equipment marketing, and various aspects of diving for scientific purposes. Matt Kay is a good example of one of the people we interviewed. Matt is a marine biologist and diver who instructs at Santa Barbara City College and is a researcher at the University of California, Santa Barbara. He also has his own private consulting firm. Although you can be a marine biologist without being a diver, many marine biologists will tell you that diving is vital to their work and understanding how marine creatures live and interact in their environment. For Matt, who grew up in Santa Barbara, with the ocean in his backyard, it was a logical progression in his lifelong fascination with the sea. 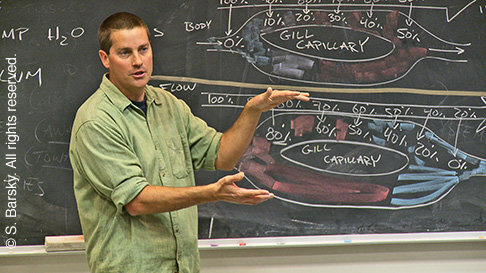 Matt Kay lectures in biology at Santa Barbara City College While Matt’s initial involvement with scuba was personal, he quickly realized that diving was a powerful tool for observation and conducting scientific research in the ocean. He earned a bachelor’s degree at the University of Oregon and a PhD. at the University of California, Santa Barbara. Matt’s study of the biology of ocean dwelling fish and invertebrates has taken him to many different areas including; working in the kelp forests off the California coast, studying coral reef growth rates in Tahiti, and Australia where he studied abalone (a giant marine snail). Matt loves the field of marine biology for the many opportunities it presents, including teaching, conducting original research, working for a governmental wildlife agency, or providing consulting services. In his career, he’s had the opportunity to explore all of these avenues. Prior to becoming a marine biologist, Matt explored many different jobs including driving delivery trucks, working in landscaping, and working construction. However, it wasn’t until Matt arrived at biology that he knew he had found his “passion.” He recognized that it was critically important for him to find a job that he loved to do every day. Two tools that Matt has found the most critical in doing his research are scuba diving and the fishing gear employed by commercial fisherman with whom he has established working relationships. For example, for the past several years, Matt has been actively engaged in research on the California spiny lobster (Panulirus interruptus). Part of his research has taken him underwater to make direct observations on lobsters, while another part of it has taken him aboard the boats of commercial fishermen to measure and tag large numbers of lobsters to help collect his data. 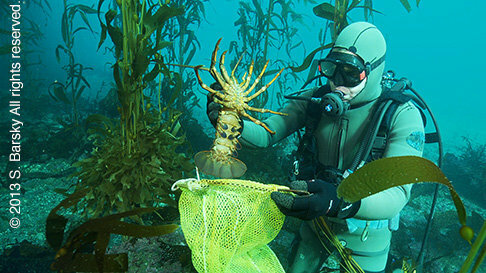 The two activities, diving and the cooperation of commercial fishermen, provide him with an unbeatable combination of techniques that allow him to trace the movements of lobsters underwater. Matt Kay collects a lobster that will be tagged, weighed, and released What Matt likes best about the combination of scuba diving and marine biology is the feeling he gets whenever he goes diving and observes some new creature or animal behavior. For him, the exciting part of being a research scientist is the opportunity to make a discovery that perhaps no person has seen or known before. You can see Matt’s video interview, with underwater footage at .